Limited lodger facilities on R.A.A.F. Station. Lt. (E) P.J. Rugg R.N. Feb 52 - Aug 52? Lt. (A/E)(P) A. Peglr R.N. Aug 52? - ? The airfield lies on a flat island on the river Nishiki delta. The town of Iwakuni is adjacent, W. Iwakuni is 30 miles from Hiroshima. Osaka lies 300 miles, and Tokyo 600 miles, East of Iwakuni. The Naval base at Kure lies 25 miles East (by sea) across the Hiroshima Bay, and 50 miles by road. The port of Sasebo lies 225 miles (by road) to the West. The river Imatsu, running into Hiroshima Bay, which forms the N. and the River Monzen the W. borders of the airfield. The E. coast borders the Inland Sea. The large island of Miya Jima, lies 1 mile North and Atata Island lies 1 mile East in the Inland Sea. Access by sea for naval lighters. 02/20 QDM. ---° ---° .... 1,866 x 66 yds. Extendable to SE. E/W QDM. ---° ---° .... 1,366 x 66 yds. Taxi track connect the central dispersal area to the W and S. ends of the two runways. Width unknown. Field flooded at very high tides. 8 small - in three groups, two triples and one double. Small Island in the Inland Sea used for bombing, strafing and RP practice. Individual communications aircraft (Carrier Onboard Delivery) called at the station during the duration of the Korean conflict. Individual naval aircraft were test flown by the AHU on the station during the duration of the Korean conflict, and were flown out for delivery to RN carriers. Disembarked from HMS TRIUMPH 15.04.50, re-embarked 09.05.50. Disembarked from HMS OCEAN 01 - 08.06.53. Detachment of 6 disembarked from HMAS SYDNEY 19-25.11.53. Disembarked from H.M.S. VENGEANCE 23.04.46 . moved to B.C.A.S. Miho 07.05.46. Disembarked from H.M.S. VENGEANCE 23.04.46. Moved to B.C.A.S. Miho 07.05.46. Disembarked from H.M.S. VENGEANCE 23.04.46. moved to B.C.A.S. Miho 07.0546. Redesignated No. 30 Transport Unit in November 1951. Disbanded & reformed as 36 (Transport) Squadron 10.04.53. Equipped with Douglas C–47 Dakotas & CAC Wirraway. Moved here from Digri (India) March 1946. Renamed British Commonwealth Air Hospital, Iwakuni. Disbanded here March 1948. Moved here from RAF Tambaram May 1946. Moved to Kure July 1946. Arrived 09.04.46. Moved to B.C.A.S. Bofu 11.04.46. Moved here from B.C.A.S. Bofu 02.48. Disbanded here 29.10.48. Arrived 09.04.46. 1Moved to B.C.A.S. Bofu 11.10.46. Equipped with P-51 Mustangs, later Meteors. Moved here from B.C.A.S. Bofu April 1948. Disbanded here 29.10.48. Detachment operated from RAF Seletar June 1952 - 11.08.54. Moved here from Singapore March 1946. Disbanded April 1948. Responsible for 30 Transport Unit, 36 Transport Squadron, 391 (Base) Squadron and 491 (Maintenance) Squadrons at RAAF Iwakuni during the Korean conflict. Detachment operated from 11.09.50 till 18.12.50. Formed at Iwakuni 20.10.50. Disbanded here 13.12.54. Formed here April 1946. Disbanded August 1946. Moved here from RAAF Archerfield 12.04.46. Disbanded here 21.08.46. Arrived July 1951, Moved to Pusan at the end of the month. Equipped with 5 Auster Vs. Arrived Sept 1951. Moved to Seoul Oct 1951. Oct 1947 - Feb 1948. A Japanese Naval Air Station during the Second World War, Iwakuni was commissioned July 8, 1940. The station served as both a training base, operating 96 trainer aircraft, and as a local defence station operating 150 Zero fighter planes. A seaplane station was attached to the SE corner of the station which itself was built on a flat, roughly triangular shaped, island on the river Nishiki delta in the Yamaguchi Prefecture. The eastern side was bound by the Inland Sea, the other two boundaries by arms of the Nishiki River. The airfield had two concrete runways and six small hangars. Aircraft were parked in a large open parking area in front of the hangars; the low lying land was prone to flooding at very high tides. The Japanese Navy established a Yokaren (Preparatory Flight Training Program) base during 1943 and in September of that year a branch of the Etajima Naval Academy was established there, with approximately 1,000 cadets undergoing training in the Basic, Junior and Senior Officer's schools at any one time. A fighter squadron called the Kure Naval Air Group Fighter Squadron operated from Iwakuni; it was reorganized in August 1944 to become Naval Air Group 332. The Airfield managed to escape serious damage during the US B-29 bombing raids on Iwakuni in May and August 1945, the raids concentrated on the nearby oil refinery and Rail station and yard areas. On August 6th 1945 the US dropped an atomic bomb (Little Boy) on the city of Hiroshima, 30 miles to the NE; three days later, on August 9, a second bomb (Fat Man) was dropped on the city of Nagasaki and the Soviet Union issued a declaration of war. On August 15, Japan announced its surrender to the Allies (V-J Day). On September 2nd, the instrument of surrender was signed in Tokyo Bay, effectively ending World War II. After the surrender a detachment of US Marines arrived to accept the surrender of the base from Japanese officers. A US team arrived on September 7th 1945 to assume command of Japanese survey materials on the site that related to the effects of the Atomic bomb. Initially plans were made to establish Iwakuni as a US Marine air base to house the transport squadrons of Marine Air Group 21, VMR-353 and VMR-952, to support operations in the Iwakuni Hiroshima-Kure area. The airfield was to be manned by US Navy ACORN-52, at that time stationed at Puerto Princesa, Palawan, Philippines. The first echelon of the unit arrived by air and landed on the airfield on October 5th; they had been aiming to land in Kure but were diverted to Iwakuni due to the facilities at Kure being unsuitable. This party included the prospective commander of the marine air base, the public works officer of ACORN 52, and seven enlisted men; they carried rations for fifteen days. On the 9th the commanding officer flew to Kure in a Japanese training plane that had been found in airworthy condition on the station, to report to the area HQ. The second echelon comprising of 16 officers and 178 men, and 1,000 tons of material, embarked on the USS LST-202 on October 1st, arrived in the port of Hirowan on the 11th to await further orders. A third echelon of 7 officers and 90 enlisted, with 330 tons of materials embarked in USS LST-640 on the 23rd but the planned base was cancelled the following day, ACORN-52 was reassigned to the Island of Truk. The party ashore at Iwakuni withdrew to join the second echelon aboard LST-202 on November 1st. Responsibility for the demilitarisation of the Iwakuni area passed from the US marines V Amphibious Corp to 6th Army on November 18th. It passed to the British Commonwealth Occupation Force (BCOF) on February 21st 1946. The BCOF was an Australian led joint British, Indian and New Zealand force; Lieutenant General J. Northcott, an Australian, was appointed as Commander-In-Chief with his headquarters in Kure. 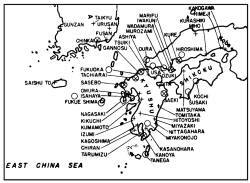 The BCOF was also responsible for the occupation of the western prefectures of Shimane, Yamaguchi, Tottori, Okayama, Hiroshima and Shikoku Island. Iwakuni airfield and seaplane base was chosen to house the Headquarters of the British Commonwealth Occupation Force (BCOF) Air Group. The BCOF Air Group was a multinational force comprising of squadrons and support units from Australia, Britain, India, and New Zealand, it came under the operational control of the Fifth U.S. Air Force. On February 22nd the lead elements of No. 5 Airfield Construction Squadron (5 ACS) Royal Australian Air Force arrived in three LSTs which grounded at the seaplane slipway to unload. Three days later the unit established itself in the hangars and existing buildings at the slipway and work began on the reconstruction of the airfield and its facilities; by this time much of the corrugated iron had been stripped from the almost brand new hangers for use as building materials to house the homeless at Hiroshima only 30 miles away to the NE, after the atomic bomb blast. The first buildings to receive the attention of 5 ACS were seven accommodation blocks, work starting on March 1st to replace windows, doors, and ceilings, electrical and plumbing installations. On the same day Air Vice-Marshal C.A. Bouchier opened Iwakuni as the headquarters of the British Commonwealth Air Group (BCAG). The following week, the 81st Wing, Royal Australian Air Force, flew in from Borneo completing a ferry flight of 3,000 miles. The Wing comprised of three fighter squadrons Nos. 76, 77 and 82 Squadrons, operating P-51 Mustangs; 76 and 77 squadrons began arriving at Iwakuni on March 9th, 82 Squadron went directly to British Commonwealth Air Station (BCAS) Bofu. 76 Squadron departed for BCAS Bofu two days later. 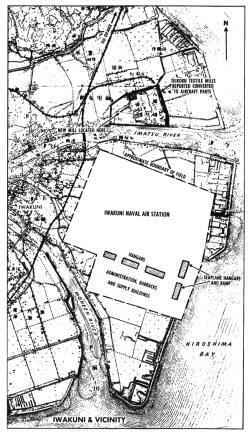 The Royal Air Force (RAF) arrived on the station during March 1946 with the establishment of several units in the area; No.91 Air Stores Park, (EP) moved here from Singapore, No. 241 Air-Sea Rescue Unit (ASRU), 56 Mobile Field Hospital arrived from India and became the British Commonwealth Air Hospital, Iwakuni. No. 5 Hygiene and Malaria Control Unit, also recorded as present was No. 21 M.T.R.U., (Motor Transport Repair Unit?). In April No.211 Staging Post was established along with No. 704 Forecast Centre and the Dakotas of 1315 Transport Flight arrived on the base. On April 23rd the RN Light Fleet carriers HMS GLORY and VENGEANCE arrived off Iwakuni to deliver squadrons for the BCAG. VENGEANCE carried the 22 Spitfire Mk VIII aircraft of No. 4 Squadron Royal Indian Air Force (RIAF) and the Spitfire Mk XIVEs of No. 11 and 17 Squadrons AF; it had been planned to fly them off the carrier but this decision was changed when it became clear that excellent facilities were provided for offloading and transporting the aircraft, all the Spitfires were transported ashore on barges, from where they were pushed to the Air Station. The following day GLORY unloaded the 24 Corsair FG-1Ds of No. 14 Squadron Royal New Zealand Air Force (RNZAF) and the unit’s stores and personnel. No.s 4, 11 and 17 squadron’s stay at Iwakuni was only a temporary however as they all for their permanent base, BCAS Miho on May 7th, leaving 77 squadron RAAF and 14 Squadron RNZAF as the main flying units., The RAF, RAAF and RNZAF had established their own station headquarters on the site; this situation remained until early in 1948 when the BCOF began winding down operations in Japan. The RAF also began winding down; 211 Staging Post and 1315 Transport Flight had disbanded in August 1946, 704 Forecast Centre, disbanded at the end of July 1947, followed by 241 ASRU which closed in November. No. 5 Hygiene and Malaria Control Unit disbanded in 1948, during March the remaining un its 21 M.T.R.U., British Commonwealth Air Hospital, and 91 ASP disbanded in March 1948; 91 ASP the was last RAF unit to be closed there. The RAAF presence in Japan was to be reduced to a single flying squadron and plans were put in motion to reorganise the force. No. 76 Squadron returned from BCAS Bofu in February 1948, being replaced by 14 Squadron RNZAF, who remained at BCAS Bofu until they disbanded there in October 1949. BCAS Iwakuni became a RAAF Base at the start of March 1948, the RAAF now being the only Commonwealth nation operating from the base.. No. 76 Squadron eventually disbanded at Iwakuni on October 29th 1948, and 5 ACS gradually transferred its remaining responsibilities to the works officer of No. 77 Squadron and the unit was disbanded at Iwakuni on June 30th 1949. The Royal Navy appears to have first made use of Iwakuni in April 1950 when HMS TRIUMPH, part of the Far East Fleet, disembarked her air group on the 15th, these were the 12 Seafire Mk 47s of 800 squadron and 12 Firefly FR.1s of 827 squadron. During their time ashore TRIUMPH’s squadrons conducted exercises with 77 squadron; two days after their arrival tragedy struck when Firefly PP434 ('274/P') collided with a 77 Squadron Mustang about 3 miles South of Hiroshima during a practice interception, both aircraft plunged into the Inland Sea. Lt. A. Baillie bailed out but was unable to inflate his dinghy as he had a broken arm, but was picked up by a Japanese fishing boat then transferred to a rescue launch and taken to RAAF Hospital at Kure; The Firefly Aircrewman S.W. Gibbons failed to bail out and was killed. The Mustang pilot was injured but was picked up by the ships’ flight Sea Otter. The squadrons re-embarked in TRIUMPH on May 9th and sailed for Northern Japan for exercises off Ominato. Almost exactly a year later, on Sunday, June 25th 1950, North Korea invaded South Korea and the station and 77 squadron were placed on standby for operations under the operational control of the US Fifth Air Force as part of the United Nations Command. With a build-up of UN forces in Japan RAAF Iwakuni soon became a very busy station. On June 25th HMS TRIUMPH was on route to Hong Kong, having left Ominato the day before. On Monday the 26th she was ordered to Kure to prepare for combat operations. She arrived back at Kure on the 28th and unloaded 4 unserviceable Seafires and 2 Fireflies onto the jetty before embarking stores and ammunition. Her support ship, the aircraft maintenance carrier HMS UNICORN, had already departed the area and was already in Singapore disembarking aircraft, equipment and her air engineering department (AED) personnel at Aircraft Holding Unit at RNAS S Sembawang, HMS SIMBANG, in preparation for her return to the UK and the reserve fleet. Her orders too were changed; the Admiralty decided that rather than re-embarking the entire air department they would remain at Sembawang and UNICORN would be used primarily as a ferry/replenishment carrier transporting aircraft and supplies to the Royal Navy and Commonwealth aircraft carriers operating in Korean waters. She did not sail until July 11th and rendezvoused with TRIUMPH at Sasebo on July 20th where 7 Seafires and 5 Fireflies were transferred. On the 24th she sailed for Iwakuni to collect the unserviceable aircraft left by TRIUMPH and to deliver spares. She next sailed for her first round trip voyage to Singapore, via Hong Kong to collect more aircraft and stores; on average these trips would take six weeks. From June 1950 the Royal Air Force operated a detachment of Maritime Reconnaissance Sunderland GR.5 flying boats out of the Sea Plane Base at Iwakuni, these aircraft were initially from 88 squadron based at RAF Kai Tak, Hong Kong, and from 205 and 209 Squadrons from RAF Seletar, Singapore; from the middle of 1951 all detachments were from 205 squadron. On October 12th 1959 No. 77 squadron moved to Pohang, South Korea and a new command organisation was establish at RAAF Iwakuni when 91 (Composite) Wing was formed on October 20th. UNICORN next arrived off Iwakuni on December 14th 1950 and flew a series of Aerodrome Dummy Deck Landings (ADDLs) ashore followed by Deck Landing Practice (DLP) at sea for replacement pilots for HMS THESEUS, the carrier now on station (she had replaced TRIUMPH at the end of September, her Sea Fury FB.11s and Firefly FR/AS 5s replaced TRIUMPH’s Seafire 47s and Firefly 1s), before sailing for Kure on the 27th. On her return to Singapore in January 1951 UNICORN's Air Engineering Department complement was increased by transferring Lieutenant Foster and about 25 ratings from the AHU at Sembawang. This was done in the hope that in addition to acting as a ferry carrier a limited amount of aircraft repair work would be done on board. Experience had shown that quite a number of aircraft discarded by THESEUS required 14 to 21 days work and it was uneconomical to send them on a 14 day passage to Singapore, have the work done and the aircraft then wait four to six weeks for UNICORN's next round trip. It was at about this time that the pattern of the ship's routine changed. Rather than a continual ferry run back and forth, a lot more time was spent at anchor in Sasebo acting as Depot Ship with occasional trips to Kure. She would not return to Iwakuni until March 24th 1951 when she delivered a number of Gloucester Meteors for 77 Squadron, which had been embarked in Singapore. She sailed for Sasebo on March 27th. During this visit the shortfall in ’in theatre’ support became apparent; two aircraft from THESEUS— a Firefly with one wing shot up and a Fury with half one propeller blade missing — were stranded ashore at USAF Suwon (K13), an air base about 30 miles south of Seoul, Korea. THESEUS could not spare the manpower to carry out the necessary repairs so Lieutenant Robin Foster with a team of five ratings, a mainplane, a propeller and some tools were despatched from UNICORN, tasked with the job. They went from Kure to Iwakuni and then by midday they were embarked in a USAF C-110 with the spares and equipment and flown to Suwon. The repairs were done but only after resorting to the barter system to get any assistance from the USAF who knew nothing about them and had no orders concerning loaning a crane or even accommodation. The repair party re-joined UNICORN at Kure just before she sailed again for Sasebo. By the summer of 1951 UNICORN was being utilised as a ferry/repair carrier, a stores carrier and a troop ship, this heavy work load meant her ability to deliver stocks of aircraft was affected. When she was required to make another round trip to Singapore in early June 1951 to exchange aircraft damaged beyond her repair capability, to RNAS Sembawang, and also to collect general stores from Singapore and Hong Kong, an alternative solution was sought. 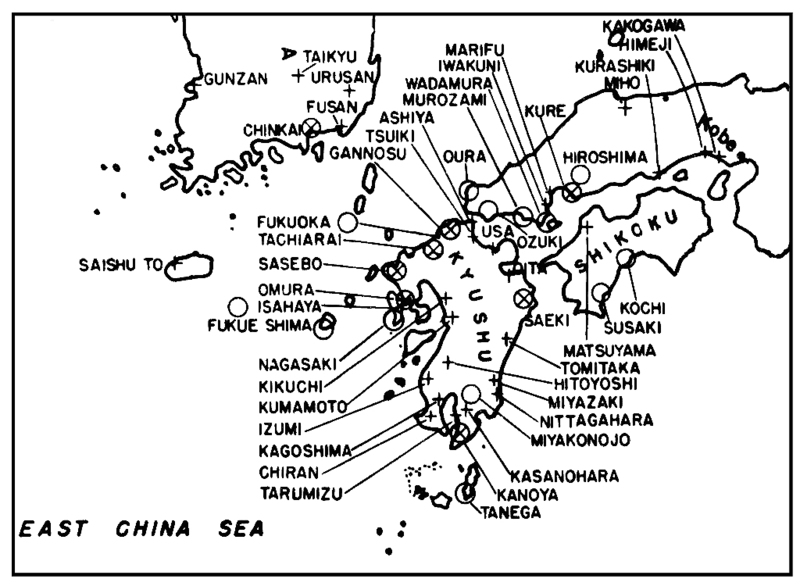 The trip would take six weeks and during this time GLORY (which had relieved THESEUS at the end of April) would require new aircraft several times during this period; the solution was to establish a small Aircraft Holding Unit (AHU) and Aircraft Repair Section (ARS) ashore at Iwakuni. Lieutenant (E) R.B.L. Foster was again in charge, this time of a party consisting of one Chief Aircraft Artificer, four Petty Officers and 20 junior ratings,. This party would hold and maintain a stock of 24 aircraft for issue as needed as well as attempt local repairs. They were made very welcome, but there were no facilities for the RN party, who found themselves on a remote hardstanding with only a three-ton truck and their aircraft. The truck served as office, crew room and store, a tent was loaned for accommodation. By now Iwakuni was very busy, 77 Squadron RAAF was now undergoing their conversion to Meteors and the station was home to many lodger units, the largest was about 80 USAF B-25 Marauders, some US Navy Neptunes and a flight of four RAF Sunderlands. It was also a staging post for QANTAS, US Military Air Transport Service (MATS) and RAF Transport Command. There was no hangar space for the RN to use at first, later half of one hangar was cleared, sufficient to hold four aircraft with wings folded, essential for maintenance in the winter months. The AHU aimed to have one Firefly and one Fury kept at 24 hours notice, other aircraft would then be brought to readiness as required based on numbers of A25s (accident) Signals generated by the carrier. The work was on a fairly predictable 20-day cycle, the average length of a carrier patrol. On carriers return to Kure harbour the replacement aircraft would be delivered by lighter and any wrecks brought back, either for on-site repair or to await the return of UNICORN which would transport them to RNAS Sembawang. Often the carrier would send over some pilots to test fly the aircraft and inevitably there would be other pilots who needed ADDL sessions or armament practice. This would result in a four or five day intensive flying programme. Depending on the work load, they could relax while the carrier returned to station and started generating more A25s. HMS GLORY returned to Kure on July 22nd for a rest period between patrols and several aircrews were sent to AHU at Iwakuni to carry out test flights on recently repaired aircraft. It had been intended to exchange 6 aircraft before sailing for her sixth patrol but she was sailed at short notice to support the American carrier USS SICILY, she left Kure on the 24th; the aircrew left ashore at Iwakuni flew out by helicopter later. She returned to Iwakuni, on route to Kure, on August 11th and this time eleven aircraft were exchanged before the ship proceeded to Kure harbour later the same day. On July 17th a further batch of Meteors and the 6 Auster Mk 5s and personnel of No. 1903 (Independent) Air Observation Post Flight were put ashore from UNICORN at Iwakuni. A second Auster equipped unit, 1913 Light Liaison Flight arrived in September, both had moved by the end of October 1951. HMAS SYDNEY was to relieve GLORY on station at the start of October 1951, the first, and only, commonwealth manned carrier to participate in the Korean War. GLORY returned to Kure September 27th and moored on the opposite side of the pontoon to SYDNEY which was already there; over the next four days all serviceable Fireflies from 812 squadron, and associated air stores, were transferred to SYDNEY for 817 squadron. On the 29th an SAR helicopter, a Dragonfly HR.1 VZ965 was issued from ARS Iwakuni to operate as Ship's Flight aboard HMAS SYDNEY. September 1951 was also the month that commonwealth aircraft began using a beach emergency landing ground (ELG) (K53) on the Island of Paengyong-do, off the west coast of North Korea; the first recorded use was on December 7th when Sae Fury VX764 of SYDNEY’s 808 Squadron landed there, making a wheels-up landing after suffering flak damage. Over 20 aircraft made use of the ELG during the conflict, many were repaired on site and re-joined their ship; a number were salvaged and taken to ARS Iwakuni. HMAS SYDNEY sailed for Sasebo on September 30th and did not return to Kure until January 9th 1952 when she completed her sixth patrol; she exchanged eleven aircraft with AHU Iwakuni before sailing for her seventh and final patrol of her tour. She was relieved by HMS GLORY at Hong Kong on February 1st 1952; 5 Fireflies were flown across to GLORY to bolster squadron strength. HMS GLORY began her second tour as Commonwealth carrier on February 6th sailing from Sasebo. On February 10th Lieutenant (E) P.J. Rugg took over as OIC of the RN party at Iwakuni, Lieutenant Foster re-joined UNICORN’s AED. At the end of her second patrol GLORY returned to Kure at the start of March and 1 Sea Fury and 1 Firefly were exchanged, plus one spare Firefly, embarked by lighter from at Iwakuni. 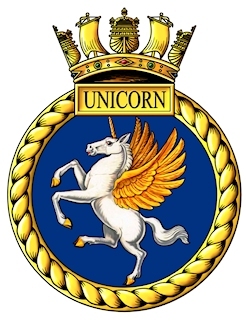 On her return from her fourth patrol on April 11th she found UNICORN present alongside the jetty at Kure and replacement aircraft were passed over by dockyard crane. Before sailing again for her fifth and final patrol of her tour, she received Dragonfly HR.1 VZ965, issued from AHU Iwakuni to the Ship's Flight on the 16th. HMS GLORY was relieved by HMS OCEAN at Hong Kong on May 3rd, stores, aircraft and personnel were ferried over before OCEAN sailed for Sasebo. OCEAN arrived at Kure on completion of her second patrol on June 6th and replacement aircraft were exchanged by lighter from AHU Iwakuni. On June 10th a fire broke out in the dockyard when AVGAS, which had leaked during transfer to OCEAN, ignited and set fire to the ship’s paintwork and damaging three Fireflies on the flight deck. One Firefly had to be exchanged with one from the AHU, it required the entire rear half of the fuselage to be replaced. The other two required rudder charges and minor repairs done on board. On her next stay in Kure, on August 1st, three RNVR pilots joined 802 squadron and spent time ashore at Iwakuni doing familiarisation flights and ADDls. Two replacement Fireflies were issued from the AHU before OCEAN sailed on August 8th for her sixth patrol. One of her Fireflies, WE733 ('103/0') of 802 Squadron was the first aircraft to be delivered to ARS Iwakuni after being salvaged from Paengyong-do ELG on August 19th, after making a wheels up landing on the beach, following flak damage to hydraulic lines on the 14th. During August Lieutenant (A/E)(P) A. Pegler took over as OIC of the RN party at Iwakuni, Lieutenant Rugg re-joined UNICORN; being a pilot, Lieutenant Pegler’s arrival helped ease the test flying situation, previously test flights had to wait for UNICORN or the operational carrier to return to Kure in order to borrow some pilots. The British Commonwealth Occupation Force ceased to exist on April 28, 1952 when the San Francisco Peace Treaty came into force and Japan's independence was fully restored, Commonwealth forces still stationed in the country were re-titled British Commonwealth Forces Korea. Control of the Iwakuni air base was handed over to the USAF in April 1952. 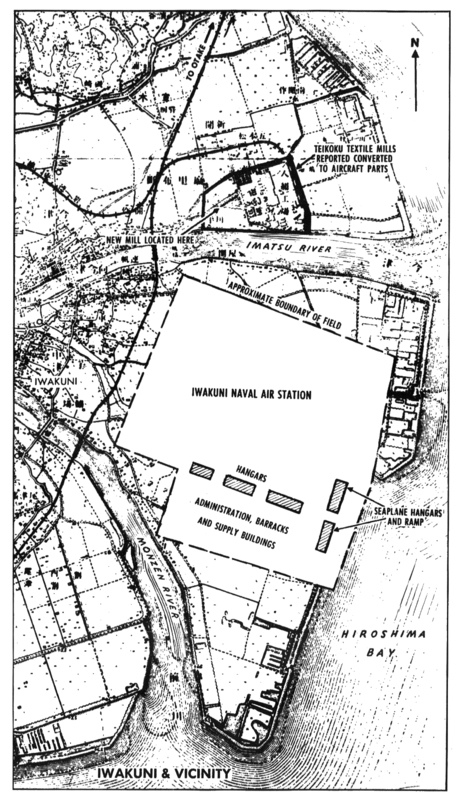 The US Navy established Naval Air Facility Iwakuni on a section of the station on 15 May 1952. HMS GLORY returned for a third operational tour on November 8th 1952, rendezvoused with OCEAN off Hong Kong on the 4th for exercises before embarking 5 Sea Furies, 2 Fireflies and 2 Dragonfly helicopters from OCEAN, along with some aircrew, before sailing for Sasebo on the 6th. UNICORN anchored off Iwakuni on December 3rd to exchange aircraft in preparation for her return to Singapore for a refit. She sailed on December 5th. OCEAN returned to Kure for a short stay, 9th – 15th December and several new pilots joined her from Iwakuni where they had been carrying out ADDLs. She spent Christmas on patrol, allowing her US counterpart the USS BADOENG STRAIT to remain in harbour for the holiday; she arrived back at Iwakuni on the 28th to embark 3 replacement Fireflies before sailing for Sasebo later in the day. A fourth replacement Firefly flew out later and landed on during passage. On completion of her fourth patrol she again anchored off Iwakuni to receive replacement aircraft and to disembark one Firefly due for full rigging check before proceeding to Kure on January 13th 1953. HMS UNICORN was waiting at Kure when GLORY returned from her eighth patrol on March 28th, where she the ships were moored on opposite sides of the pontoon and replacement aircraft were exchanged directly. Glory sailed for her nit patrol on April 4th, UNICORN sailed for Singapore, calling at Iwakuni to exchange airframes before proceeding to Hong Kong. HMS OCEAN returned for her second tour, relieving GLORY at Sasebo on May 17th. On departing from Kure on the 15th GLORY flew off 5 Fireflies and 3 Sea Furies ashore to AHU Iwakuni to swell the stock of spares available for OCEAN. The following day the AHU and GLORY exchanged unserviceable aircraft by lighter; those needing minor maintenance going ashore, in exchange for those needing major work which were embarked for passage to RNAS Sembawang. She sailed for Sasebo (and then the UK via Singapore) on the 17th. OCEAN was in Sasebo at the end of May; while at anchor on June 1st she launched 13 Sea Furies of 807 squadron to fly to Iwakuni for a planned fly-past over the Commonwealth Division at Seoul to celebrate Coronation Day, June 2nd. This unique evolution was accomplished using Rocket Assisted Take Off Gear (RATOG), the ship’s head being pointed on a safe bearing by a small tug. The weather was bad all the way there and the aircraft had to be parked outside overnight in pouring rain –as were all the ‘serviceable’ spare aircraft held by the AHU. On the 2nd problems starting up, problems with radios and general moisture ingress plagued the squadron, eventually 12 reached Seoul; one had to return to Iwakuni unserviceable. The aircraft returned to Iwakuni on the 3rd remained ashore until the ship arrived off Iwakuni on the 8th. Twelve aircraft flew aboard in the afternoon; one flown by Sub-Lt. ML Hayes made a forced landing at Iwakuni, his engine repeatedly cutting out. OCEAN sailed for her second patrol that evening. HMS OCEAN was nearing the end of her fourth patrol when the armistice was signed at 10 am on July 27th 1953; it came into effect at 10 pm, ending three years, one month, and two days of war in Korea. The Armistice also called upon the governments of South Korea, North Korea, China and the United States to participate in continued peace talks. The war is considered to have ended at this point, even though there was no peace treaty. During her fifth patrol OCEAN’s captain took over as Officer in Tactical Command on August 6th 1953, the task force with which she and other commonwealth carriers had operated was dissolved on this date and many ships were released for duty. She carried out patrols in international waters off the west coast of North Korea for most of August. She carried out four more patrols before sailing for the UK on October 21st to pay off. On October 27th 1953 HMAS SYDNEY departed Fremantle for her second tour of duty in Korean waters. She relived HMS OCEAN as the commonwealth carrier at the start of November. On the 6th 2 Dragonfly SAR helicopters embarked, ex HMS OCEAN ship’s flight. On November 19th SYDNEY was off Iwakuni and flew off a detachment of 6 Sea Furies of 850 squadron, re-embarking on the 25th. She exchanged 2 Fireflies and 2 Sea Furies on Decanter 13th. On her return in February 1954 she exchanged one of her Dragonflies on the 11th and on the 20th one of 816 squadron’s Firefly FR5s VX420. ('237/K'), had a tail wheel shimmy on landing at Iwakuni. She made one further replenishment call at Iwakuni on April 16th 1954 when she embarked 2 Fireflies and 3 Sea Furies. Her tour ended in May 4th 1954; she was not relieved by another carrier. Before leaving Japan for Australia she disembarked her unserviceable aircraft to the AHU. HMAS SYDNEY’s departure marked the end of the commonwealth participation in operations off Korea, and the end of the RN Aircraft Holding Unit at Iwakuni; the final stocks of aircraft were loaded aboard HMS UNICORN in the second week of May 1954 and the RN AHU was withdrawn. The aircraft were off loaded to RNAS Sembawang on the 18th – 20th May. During its time at Iwakuni over 86 Sea Fury and 45 Fireflies, a small number of Dragonfly helicopters, passed through the AHU. There was surprisingly few flying incidents recorded involving RN aircraft operating out of Iwakuni, during the Korean War, only four, all involving Sea Fury aircraft. March 26th 1952 Lt-Cdr D.A. McNaughton in Sea Fury WE685 aborted his take-off after his engine cut out; March 10th 1953 Sub-Lt. M.B. Smith in Sea Fury WG599 made an Emergency wheels down landing following engine failure; June 2nd 1953 Lt AR Pearson in Sea Fury WJ236 accidentally retracted the undercarriage when taxying off runway after landing; October 6th an unidentified pilot in Sea Fury WG597 crashed on the runway. The US Navy took over the station October 1st 1954, shortly before the Royal Australian Air Force began to wind-down operations on the base. On December 13th No. 491 (Maintenance) Squadron, disbanded, followed by the departure of 36 (Transport) Squadron, for RAAF Canberra on April 13th 1955. RAAF Iwakuni was officially closed on April 30th 1955 with the disbandment of 91 (Composite) Wing and 391 (Base) Squadron. In 1954 the Self-Defence Forces Law was passed with established Japan’s post war armed forces; the Japanese Self Defence Force (JSDF). Two branches were established, the Japanese Air Self Defence Force (JASDF) and the Japanese Maritime Self Defence Force (JMSDF), and elements of each were operated from the air station at Iwakuni; from October 1954 the base was a joint USNAS and JASDF base, the JMSDF arrived on site in 1956. Naval Air Station Iwakuni was greatly enlarged in July 1956 when the 1st Marine Aircraft Wing moved its headquarters here from Korea. A whole new area was procured on the North side of the station to make room for approximately 2,500 US Marines. The US Marine Corps first took control of the installation as Marine Corps Air Facility Iwakuni in 1958. It was officially designated as USMC Air Station Iwakuni in 1962 In 1997 the stations runway was relocated 1,000 meters offshore eastwards by reclaiming a half mile of the Seto Inland Sea. In 20145 the base is home these major units: Marine Aircraft Group 12, 374th Airlift Wing USAF, and Fleet Air Wing 31 JMSDF. 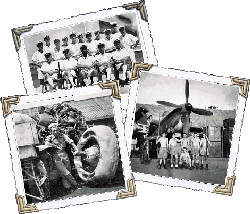 Web site - 14 (FIGHTER) SQUADRON'S CORSAIRS IN JAPAN 1946 -1948 Permission to reproduce photos. Web site - 656 Squadron Association Permission to reproduce photos. Basic layout of Iwakuni Naval Air Station and surrounding area as a USAF Target Area plan, in 1945.